Some of the feedback from the road shows was that you wanted more employment, particularly for young people and for lower skilled jobs. You also thought that tourism could be supported more, to bring in more income to the High Street. You noted the high rents for businesses on Marlborough High Street. The employment and business working group was set up to take forward these concerns. Businesses in the area mostly fall into three main groups; retailers on Marlborough High Street, covering goods and services and divided into independents and branches of national chains; public sector including education and health; and small industrial units, located generally in the outskirts of town and in the parishes. The Neighbourhood Plan can help to reflect employment needs if they relate to land use; that is our remit. So, for example, if a business wants to expand and employ more people, but cannot do so because there is no available land, the Plan can support the freeing up of land to make this happen. So the working group’s role is to liaise with businesses on their needs and future plans, to identify any “blockers” to business expansion related to land use that the Plan can help with, and, in the light of feedback received, to recommend the Plan’s approach in this area. What has the Business and Employment working group been doing? We looked at factors that might make it difficult for people to take up jobs in the area, such as the high cost of housing, which the housing working group is addressing. The employment group wanted to receive feedback from businesses on what their future needs for premises are, so it commissioned a questionnaire from Cobweb Consultants. (The questionnaire and Cobweb’s conclusions can be found here). Returns came mostly from small independents, typically with under 3 employees. Nearly half work from home. They showed that there are few plans for expansion which might need new premises and/or additional employment. If they did, it was for small units of less than 50 m2. 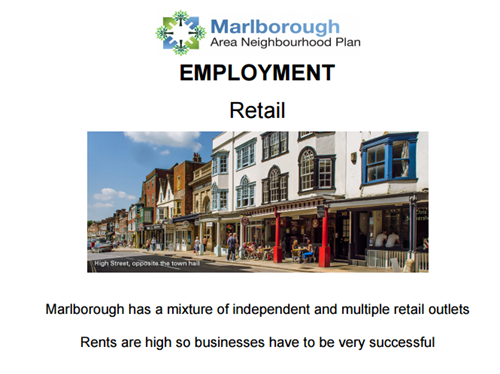 We received little response in the survey from the retail sector in Marlborough, and from the public sector. So we made further contacts to ensure that we had as complete a picture as possible on business needs. We talked to representatives from Marlborough College, care homes and schools, as the biggest employers in the area. They said that they were unlikely to need more land in the medium term. They also confirmed that not all job vacancies were filled, so there did not seem to be a shortage of job opportunities; but for employees on lower wages, cheaper housing and transport costs would help local people to get jobs. We held interviews with the Chamber of Commerce, who noted no particular need for expansion, while noting the advantages of working from the business park rather than the centre of Marlborough because of easier parking and traffic. The Marlborough Retailers’ Association highlighted staff parking as a big problem. The Doctor’s surgery needs premises of twice their existing size in the centre of Marlborough to meet current demand and an expected increase in demand due to the expansion of Marlborough. Various members of the public have raised the topic of tourism; how it could be encouraged to help with employment, and this would benefit from reinstating a dedicated tourist office. Tourism is more of a hot topic now given the Great West Way initiative, under which there are plans to market the A4 corridor from west of London to Bristol and surrounding areas as a “world class tourism experience”, and promote places along the route. If Marlborough chose to become involved there would be implications for infrastructure such as traffic, signage, hotel spaces, toilets etc. The Town Council is considering this, but would expect initiatives and funding from businesses to support it. It is not for the neighbourhood plan to consider tourism as such, but we would support better provision of tourist information (whether a dedicated office, part of an existing office or by use of notice boards) to facilitate Marlborough’s profile for tourism. We are always open to views from the public (and you can give us them on the website), but we think that we have collated enough information to come to some initial conclusions. It is harder to gain the views of prospective businesses outside the area who may wish to set up in the Plan area, but we are linking with other organisations who have collected information that could help, and will refine our views if needed. Our ideas will be pulled together with those of the other working groups when we write up the plan next year so that nothing falls between the cracks, but here are our views. Our conclusions on business and employment needs and our recommendations for the Neighbourhood Plan. To encourage use of existing space above shops in the High Street for business. To liaise with our other working groups on ways to provide lower housing costs, and easier parking for employees (such as introducing employee parking permits in the town at low charges) that would support local employees. To encourage take up of vacant buildings by businesses in existing business parks. To encourage re-use and adaption of existing buildings in the villages in the Plan area (for example, farms diversifying to provide small industrial units). To request the Town Council and Wiltshire Council to keep an up to date register of all properties suitable for employment uses which are available or vacant, and to liaise with employers about their availability. To endorse re-use of redundant buildings within Marlborough and surrounding parishes, both private and public, for local businesses and services. To request the Town Council to improve the availability of tourist information. To support any actions to facilitate business, such as good broadband services across the town and rural locations.